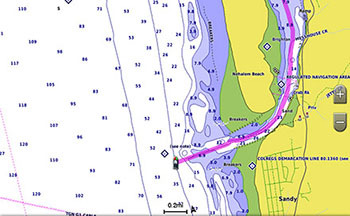 BlueChart g3 coastal charts provide industry-leading coverage, clarity and detail with integrated Garmin and Navionics data. Also included is Auto Guidance1 technology, which uses your desired depth and overhead clearance to calculate routes and provide a suggested path to follow — overlaid onto your chart. NOAA raster cartography is also available as a free downloadable feature via the ActiveCaptain app. It gives your chartplotter paper chartlike views of NOAA-surveyed areas in which individual points of interest are labeled with corresponding longitude and latitude information. Worldwide coverage is available by regions as accessory cards or via download; each region is sold separately. The Auto Guidance feature¹ calculates a suggested route using your desired depth and overhead clearance. 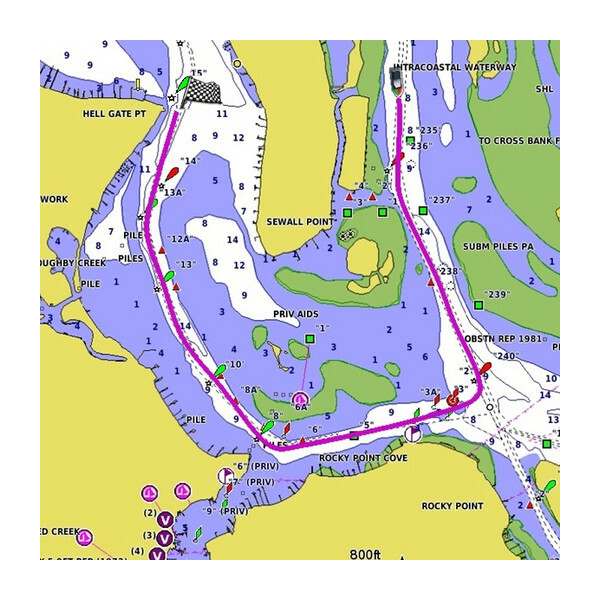 BlueChart g3 charts feature 1’ contours that provide a more accurate depiction of bottom structure for improved fishing charts and enhanced detail in swamps, canals and port plans. To aid in navigation, Shallow Water Shading allows map shading at a user-defined depth to give a clear picture of shallow waters to avoid. This feature gives your chartplotter paper chartlike views of NOAA-surveyed areas in which points of interest are labeled with corresponding longitude and latitude information.